Kingfishers have always been some of my favorite birds. Their huge bills and stocky proportions really make then stand out, and their foraging habits are quite interesting. The Belted Kingfisher is known to hover above a body of water before diving in for small fish or insects. The rarer (as least in the USA) Green Kingfisher tends to fish from perches. 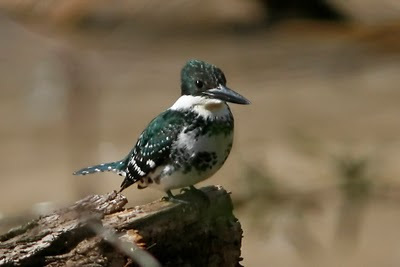 The Green Kingfisher is particularly rare in the USA and is only a consistent resident in South Texas. Most years there are also a handful of sightings in the San Pedro River area of extreme SE AZ, or sometimes around Patagonia Lake, also extreme SE AZ. In fact, I was planning a trip to San Pedro (hoping to go in April) with the main goal to see a Green Kingfisher. Little did I know one was planning to come up my way! 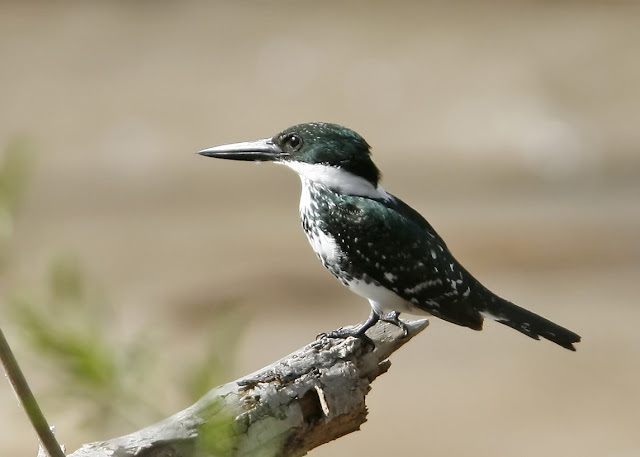 In late February the first report came in that a Green Kingfisher had been seen at Hassayampa River Preserve just WNW of Phoenix near Wickenburg. I made the short trip up there Saturday March 6, and fairly quickly was able to locate the bird (along with 6 or so other birders). For what it's worth, this bird is the first Green Kingfisher known to stray into Maricopa County, and it is also the furthest north one has ever been spotted in Arizona. According to Bird Life International, this species is thought to be expanding in numbers. Combine that with a general trend of southern birds showing up further and further north, and this may not be the last to show in Maricopa County. Like so many birds, it tends to return habitually to the same perches, so once you know where to look it is easy to find. On a related note, this was my first trip to the Hassayampa River Preserve. This is a Nature Conservancy Preserve and contains some pristine riparian habitat. The Hassayampa originates in northern AZ and actually flows underground for much of its path, but emerges for about 5 miles around the preserve. Other birds seen at the preserve include Vermillion Flycatcher, Cedar Waxwings (flock of 15+), American Robins (which have been prolific in the low deserts this winter), and even a Red-Shouldered Hawk, which is also rare for AZ. Total species seen was only 20, but they were all good ones! That would be an amazing siting! If you could, please check again and try to get a photo and post the details to the BIRDWG05 maillist. There are many that would love to see a Green Kingfisher since the Belted Kingfisher is the typical/common AZ kingfisher.